Two men have been convicted of making Facebook threats to “torch” and “blow up” a proposed new mosque in Astley Bridge. Police arrested both men for posting offensive messages on the Stop The Astley Bridge Mosque Facebook page, which has since been taken down. Leon Richmond, aged 18, wrote on the page that he would not be bothered if the mosque was built as he would “blow it up” himself. 23-year-old Darren Hubble posted: “Bolton people say no, Wigan says not a chance, I’ll torch the place if I get half the chance”. The posts related to the plan to build a large new mosque building in Blackburn Road, Astley Bridge. The plans, submitted by Taiyabah Islamic Centre, include a dome, minaret tower and 19 classrooms. They have prompted protests by objectors in the lead-up to the planning meeting on July 3, and protestors shouted abuse at councillors as the proposals were approved. Det Insp Charlotte Cadden said: “These messages were not only extremely offensive but made very serious threats to cause damage. It is becoming a regular trend for people to think they can make racially offensive comments online and get away with it – but they can’t, and these convictions show that. Richmond, of Whalley Avenue, Bolton, and Hubble, of Orrell Hall Close, Wigan, both pleaded guilty to the charges, which related to the period between May 19 and June 19 this year. They admitted making Facebook entries to the Stop The Astley Bridge Mosque page, which were indecent or grossly offensive for the purpose of causing distress or anxiety. Both men were fined £600 when they appeared before magistrates in Bolton on Wednesday, as well as being ordered to pay £145 costs. Cllr Guy Harkin, who represents Crompton, the ward where the mosque is planned, said: “There has been a lot of prejudice and nastiness going around and that is very regrettable. But the good thing is that this is just two people out of a huge population. 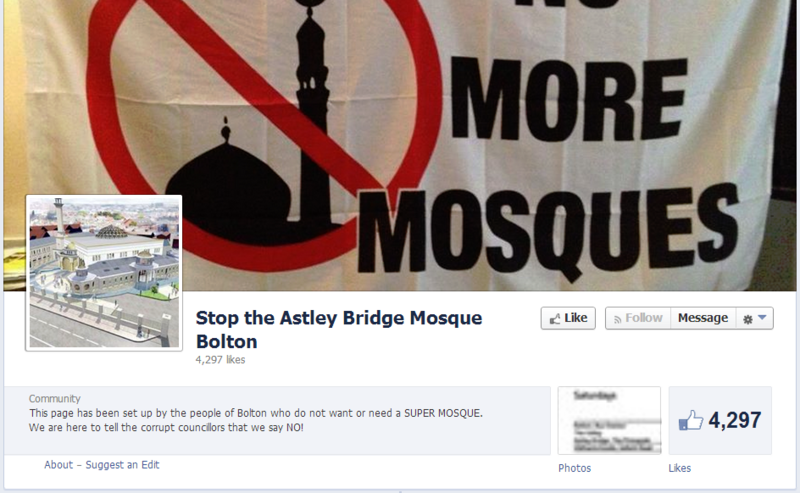 The Stop the Astley Bridge Mosque Bolton Facebook page is in fact back up again. Although the campaign was from the outset a British National Party front its organiser, BNP activist Bryn Morgan (aka Morgan Jones), tried to present it as something broader. Morgan has since been expelled from the BNP. As you can see, the campaign now makes no attempt to hid its fascist links, openly presenting itself as an arm of British Voice, the far-right group initiated by former BNP leader Nick Griffin before he broke away to form an alternative organisation, British Unity. This entry was posted in Far right racists, Resisting Islamophobia, UK by Bob Pitt. Bookmark the permalink.